After the Rehman shock, Japanese economy’s status is worse than it was initially anticipated by domestic authorities and the weakness of the structure of industry is rising to the surface. ‘The 1955 Regime’, beginning of ‘Iron-Triangle Regime’ of Post-War Japan coming to a deadlock may have something to do with this. When situations like this take place, it is always the case that some people start discussing “Leader theory” that sounds nostalgic of the activities of the people in the Meiji era such as in the novel by Ryotaro Shiba, “Saka no Ue no Kumo” (Ref. 1). However, the situation is very different today and their viewpoints seem irrelevant. Changes in the world today will not wait for Japan to catch up. If we think of 5, 10, 20 years ahead from now, it is perfectly clear that the producing future human resources should be the most important basis of national policies (in Japanese). Search in this site by keywords such as “human resources”, or “education” since there are many columns that I have written on this theme. Budget for education is extremely small in Japan compared to other developed countries. Political parties at last came up with manifests with budgets for “children, education” included for the next Shugi-in election ? a speed not at all impressively wonderful. However, though reinforcement of conventional budget on education is important, it is much more necessary to create strong policies for producing variety of talents for the future challenges. At present, the changes in this nation are too small and timid even at the level of university education. I have been pointing this out so many times in this site (Ref.1, 2) and although I do notice some good drastic attempts they are unfortunately too small to become big trends. Such activities at Asia Pacific University or Akita International University , for example, are not well known even in Japan. Graduate School of International Corporate Strategy, HItotsubashi University is a revolutionary program open to the world and is evaluated highly by international standards. By the way, reforms are underway in many of the Western universities as well as in the field of education utilizing IT technologies such as internet where totally new potentials are being sought after or being put into practice. In this respect there are several Japanese active in overseas universities such as Dr. Miyagawa who was involved in the development of MIT’s OpenCourseWare or Dr. Iiyoshi, who is seeking for new possibilities having recently moved to MIT from the Carnegie Foundation. 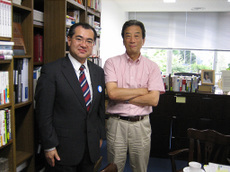 Recently, I had an opportunity to see Dr. Iiyoshi. I learned that there is a possibility of unimaginably big change in the field of education in this “Flattening” world. People of the world are very much devoted in effort to produce leaders who will lead the politics, industries, universities in the global societies with clear vision, strong will, and strong energy by strengthening the potentials of young generation, their spirits of challenge, minds not afraid to change in the face of this global age. Footnote: Person with love for the nation as I understand is “Patriot” not “Nationalist”.